Summer is full of ripe fruits and vegetables. Yellow bell peppers are as bright as the sun. Orange peppers are brilliant in color, and sweet red peppers are deep in color while bursting with flavor. An abundance of sweet bell peppers are combined with juicy ripe pineapple for a light satisfying dinner. Inspiration from the far east, or at least the local American Chinese restaurant, brought me to create this recipe. 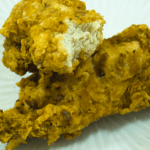 I replaced the usually deep fried chicken, with sautéed boneless skinless chicken breasts. And then I added colorful sweet bell peppers to add to nutrition and flavor. The sweetness of the peppers and pineapples balances the slightly sour sauce beautifully. The sweet and sour sauce is also flavored with garlic and ginger, and contains less sugar than most recipes. I serve this over white rice that has been cooked in onions, garlic, and chicken stock. Cut chicken into bite size pieces. Add salt and pepper. Then saute in olive oil. Cook all chicken until golden brown. Add vegetables to the pan. Add the pineapple. Do not overcook the vegetables. Add the chicken stock to a separate sauce pan. Then add the ketchup, garlic, ginger, soy sauce, vinegar, and sugar. Let this simmer for 3 -5 minutes, and then add the dissolved cornstarch in water to the sauce. Stir and simmer until thickened. Pour sauce over chicken, peppers and pineapple. Serve on cooked white or brown rice. Enjoy! Angie, I am hoping this is going to work. I took out steak to make pepper steak, tonight. I am going to apply this to the steak instead of chicken, making any necessary changes, as I go along. It sounds delicious and I don’t want to wait until we are going to have chicken. This should be interesting. .-= averagebetty´s last blog, Food Snobs and Cap’n Crunch =-. You just saved me from tomorrow night’s dinner dilemma! My husband is out of town and tomorrow, when he gets back, I need to have something not too heavy, and something that will be quicly prepared. I can prep this early. GREAT meal! .-= Tina Marie´s last blog, Gail’s Riverside Special =-. sounds yummy~ i use potato starch for sweet & sour pork/chicken. maybe i should try corn starch next time. thanks! I love your verison of sweet and sour chicken along with all of the fresh veggies you used. MMMM MMM! .-= Jessie´s last blog, Cheddar Cornmeal Biscuits with Chipotle =-. Hmm very fresh flavours. Love the sauce recipe! .-= ruth´s last blog, Rome and Seafood Spaghetti-Spaghetti Allo Scoglio =-. This looks absolutely amazing!!! I love sweet and sour chicken. It is an all time fav.! .-= My Food and lIfe Encounters´s last blog, Pasta Extravaganza =-. I just noticed that we are very close. I live in Lake Mary, FL. When you wrote about Hurricane Charlie I knew you lived in FL, but Cassleberry is really close. One of my favorite dishes. This time I’m going to try it with chicken. Thanks for the reminder. .-= Divina´s last blog, Chilled Avocado and Cucumber Soup =-. Right, that sweet and sour taste is good for cheering up our appetite during summer. .-= TasteHongKong´s last blog, Hello world! =-. I love the background in the picture. It really brings out the bright colors in the sweet and sour! .-= Barbara´s last blog, Perfect Pasta Salad =-. .-= Andrea@WellnessNotes´s last blog, Eat Your Vegetables =-. 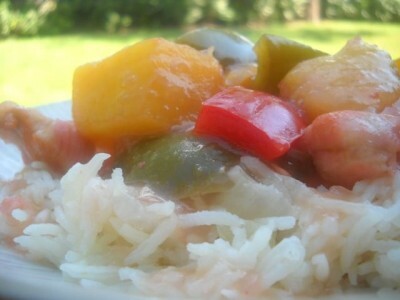 Sweet and Sour Chicken is a tasty dish to go along with white steam rice. Thank you for sharing. Cheers ! .-= sizzlechef´s last blog, Veg Mix Curry Noodles =-. This sweet and sour chicken looks wonderful! I like that you used the four different peppers, very colorful! .-= Natasha – 5 Star Foodie´s last blog, Tarragon Lobster Cakes with Spicy Papaya Queso Blanco Sauce =-. Cooking the rice with those flavors is really nice. You get a mellow flavored rice in each bite. Delicious recipe. .-= The Duo Dishes´s last blog, Foodie Meetings and Greetings =-.